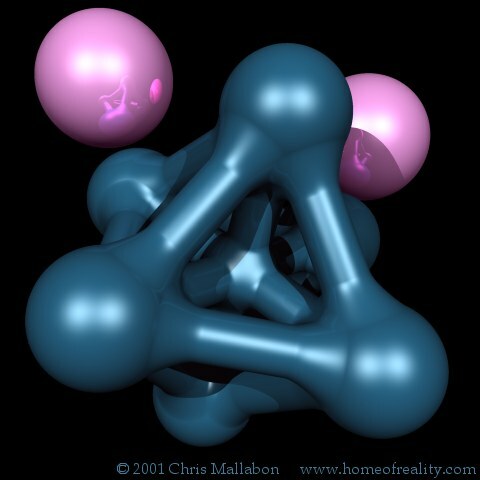 All images done with the Polyray raytracer. Note : All images redone on K6-2. 2sphquad : Don't ask, the name just came to me. This is my first image. It is a major modification of one of the blob sample files. I wish they had all been as easy as this one. Symetry1 : Second image. See a pattern yet? This was just playing with reflective textures. 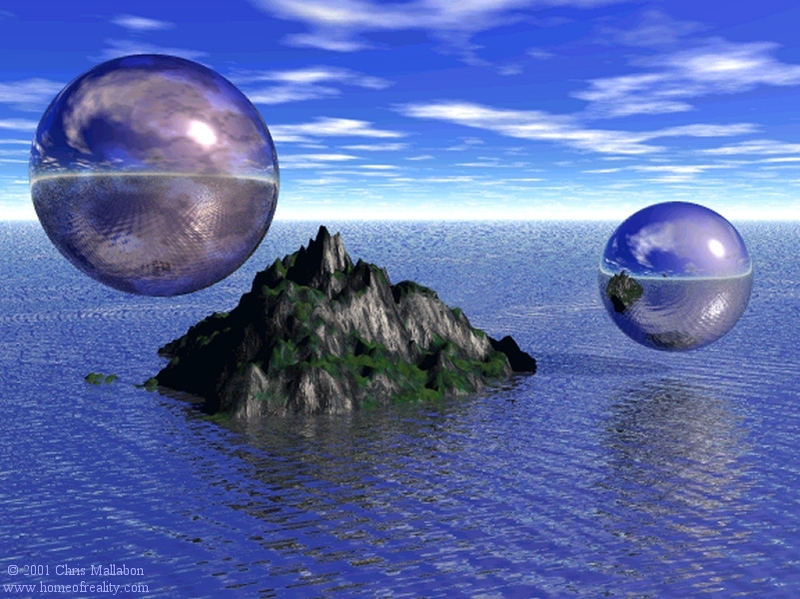 The sphere in the center is a non-transparent, invisable, 100% reflective object, a true mirror. City : Third. Can you tell this is when I got the 486? 8meg is much better than 2. I wanted to add a forest or something but not enough RAM. Desolation can be nice, though. 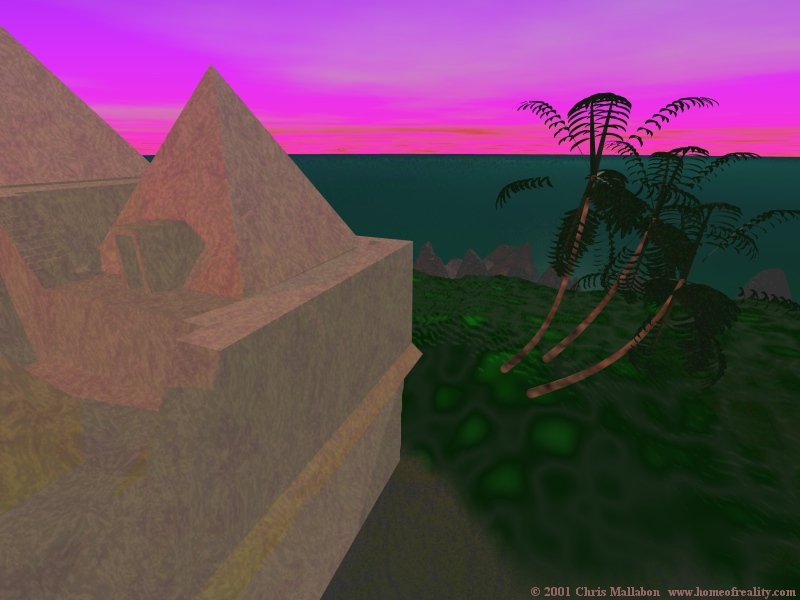 The mountains are from a mouse drawn height field (actually almost all my image height fields are mouse drawn). The ground is a noise height field with a noise texture (I LIKE NOISE). The buildings and funky cross are also noise textures. Now that I think of it, the grass is also a noise texture. Clouds,ditto, noise. The two marble textures are a recombination of the POV stone textures (more noise). 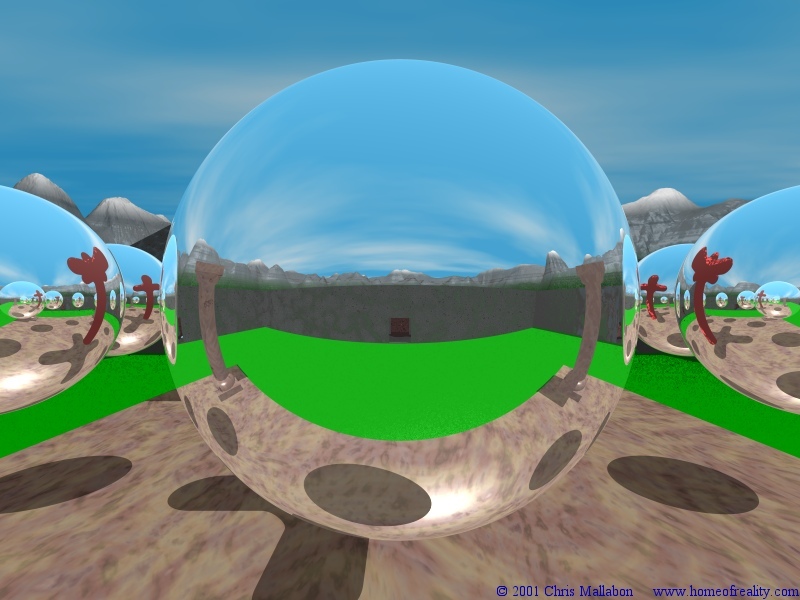 The spheres are just simple mirrors. I tried making an animation with the cross pulsing and the spheres spinning around it with the clouds moving overhead. But ,well...uh.., shall we say it was more of a throbbing. Not what I wanted. Maybe some other time. Alien_Sea : Might be breaking the pattern. I was working on several images at the same time. This is an experiment with blobs. Also some playing with layered and indexed textures. This didn't come out exactly as planned, but what does? The moon is done with noise. I'm quite impressed with myself. The height field isn't my best but it works. The wierd coloring is to create an alien appearance. Not sure why the sky is pink, it just looks neat. The clouds are copper sulfate vapor and the sea is mercury. Not a friendly place. 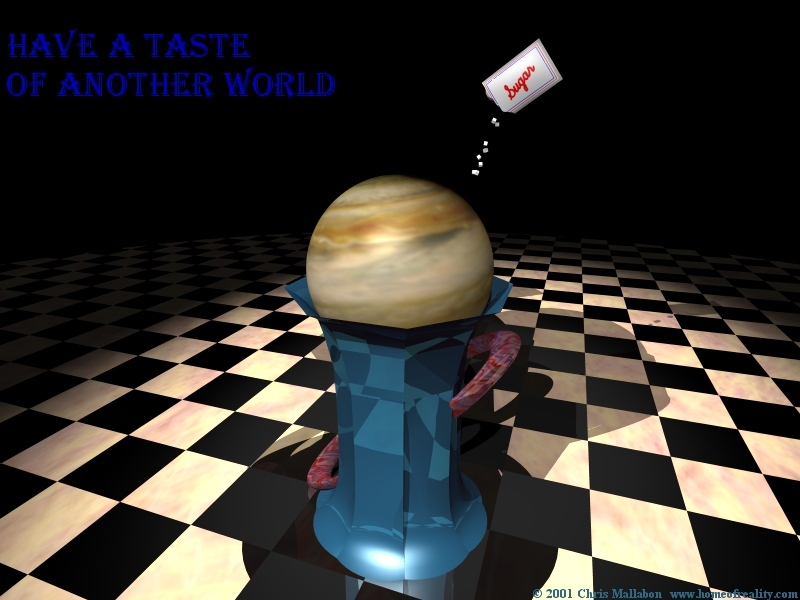 Taste : The idea for this came to me while watching cream swirl around in my coffee cup at IHOP. I was going to use a IHOP mug but they would probably want royalties and I gave them enough money as it is. The vaselike mug makes it look a bit more futuristic. It was created with bezier patches with a torus for the handle. Jupiter was done with a image from the new WFPC2 on Hubble. Thanx to NASA and JPL. I am a avid space enthusiast and a member of both The National Space Society and The Planetary Society (founded by the late Carl Sagan). 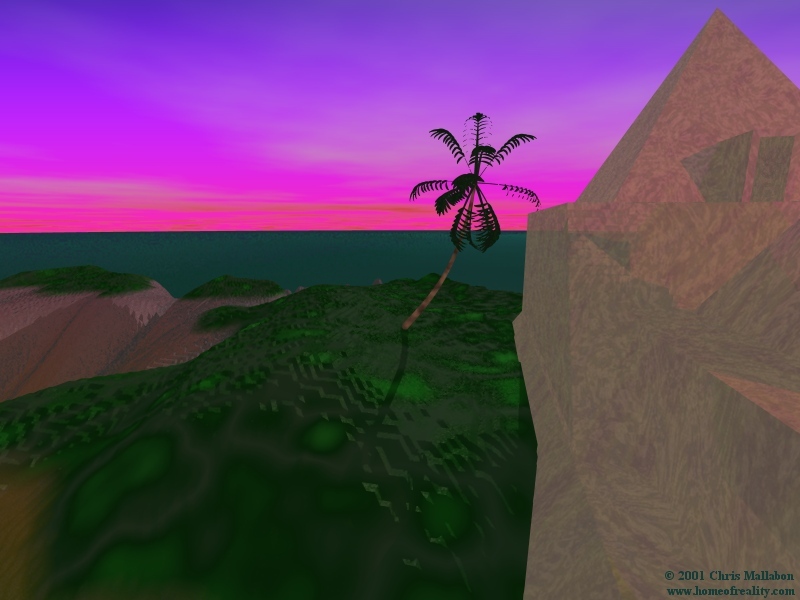 Distant_Ocean : Another alien sea. The water is much better in this one. The new version of Polyray now has bump maps so I used an image of ripples on water to create the waves. The beach is a noise height field with layered ripple and noise textures. The noise texture is very dim. The rocks were done with Fractint (I had to make an exception). The texture is a modified version of the texture on the buildings in the City series. 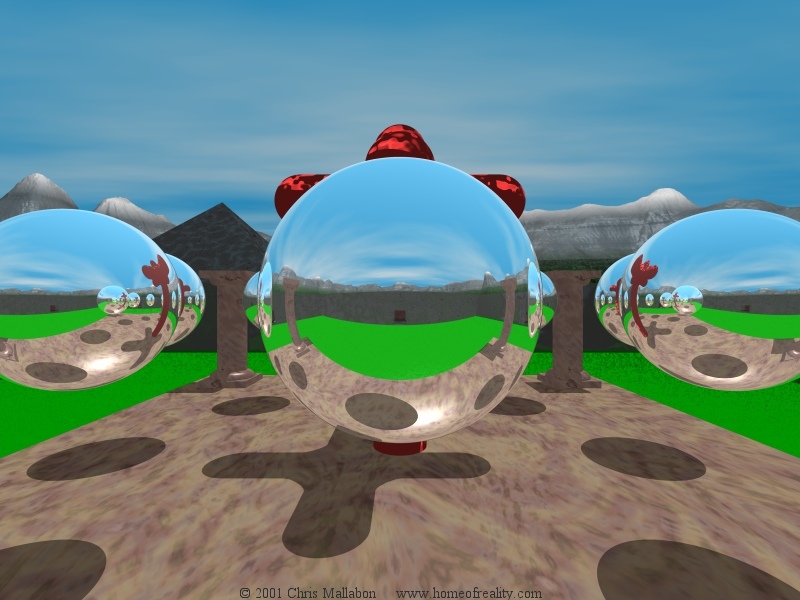 The spheres have a noise transparency texture over a mirror. 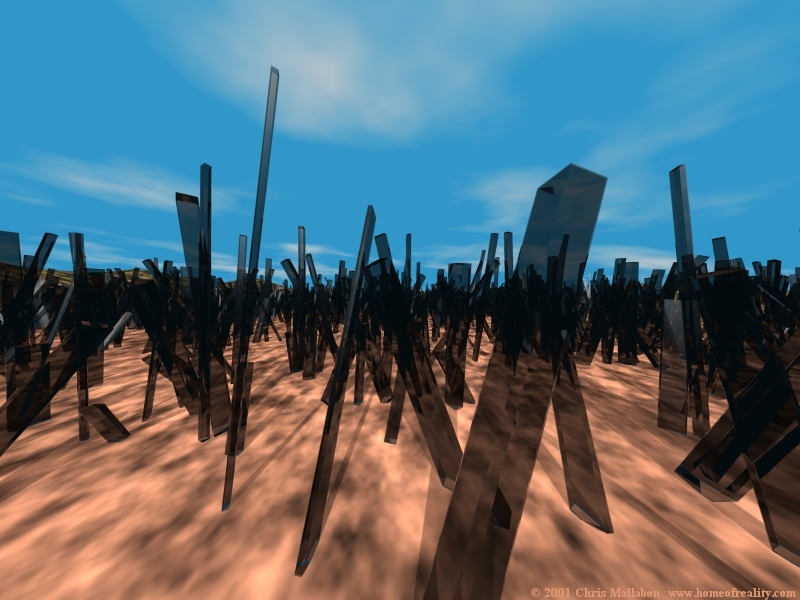 The starfield is also done with Fractint. The two images are the core of M100 courtesy of NASA (First image from fixed Hubble) and the Orion Nebula (sample image with Image Magic). The image of the Orion Nebula was enhanced with a smoothing filter I came up with for Paint Shop Pro. The filter is applied to each RGB channel separately or in pairs then all the images are combined in Image Magic. It can really bring out the colors in nebulie. 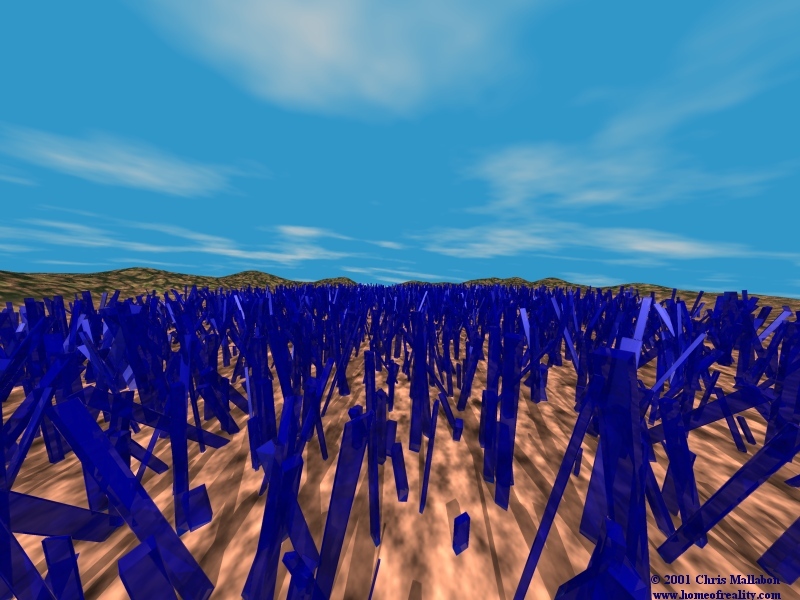 Krystal_Valley : Two different renderings of a valley of crystals. 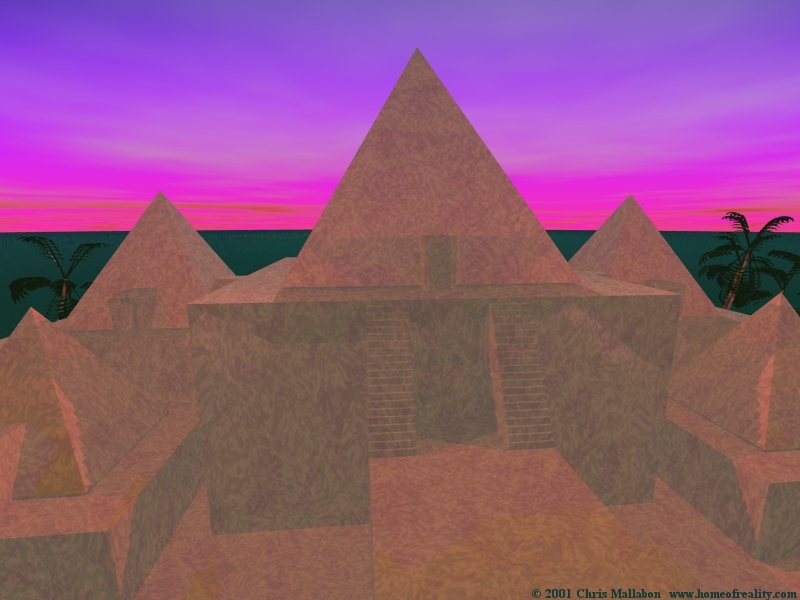 The crystals were done with the crystals program. It saved me a lot of typing. 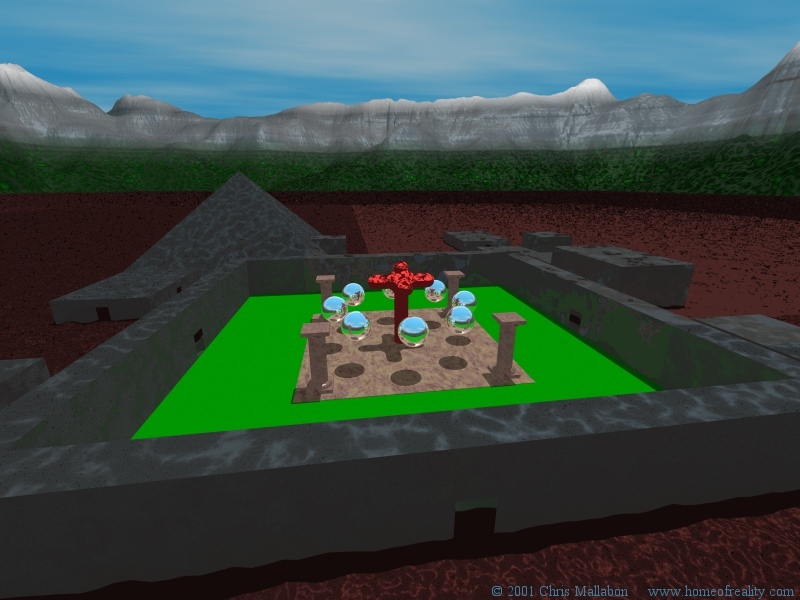 The height field is one of my best mouse-drawn ones. The texture is more noise texture. 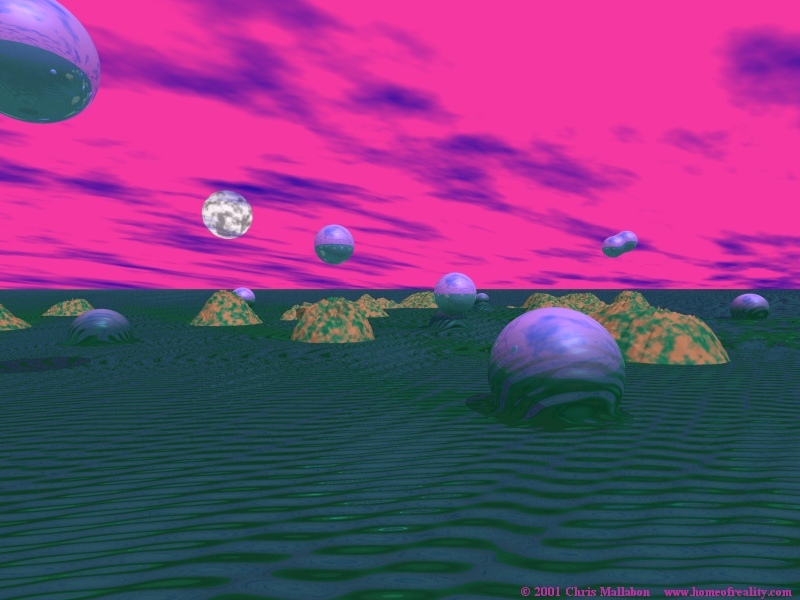 I might change the program so you can place the crystals around a sphere. That way I can make a geode. Probably in the next volume of images. The "K" is for my friend Krystal, who I was waiting for at Denny's when I came up with the idea for this picture. Temple : My personal favorite. Obviously done on the Pentium. 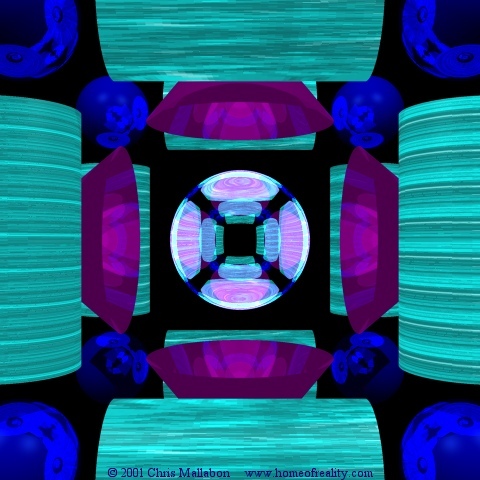 The scene was inspired by a dream and a visual while listening to some trance music. 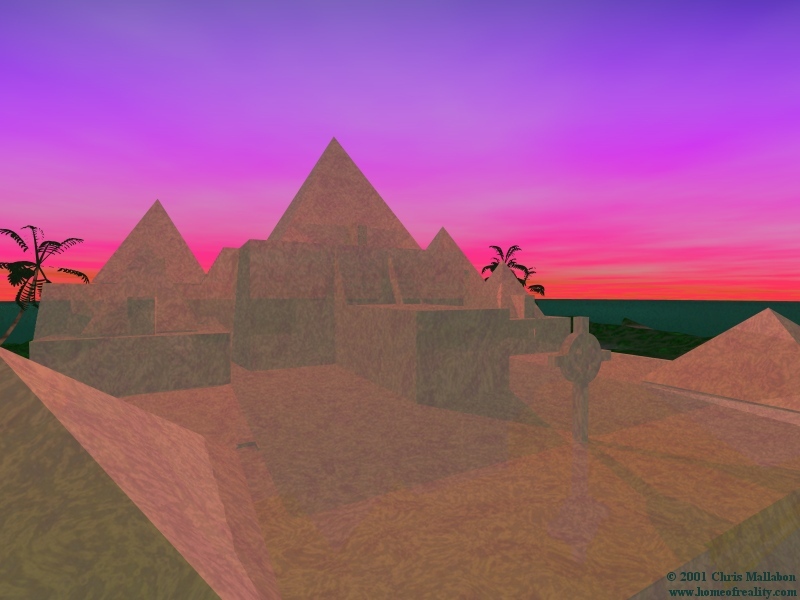 It's an abandoned alien temple. To make a real one, you would have to carve the entire complex out of a single piece of marble. If rendered from the right angle, it loses all depth because the patterns all line up. This is also the largest data file I had to type. The source file alone is 50k. The data files were created by the palm program. World_of_Colors: Way to many colors. Roughly 107,000. The spirals were done with Spiral.exe. The height field is a simple sin function with the colors based on the distance from the origin. All the other objects have different colors for each component of the texture and the specular highlight is based on the distance from the origin. Once I have a faster system, I will make an animation of this with everything moving around. Should look pretty interesting. It will be released on CD-ROM by somebody. All my animations are done in 24 bit so they take up many, many megs. I have a 405 frame shuttle animation that takes up 56 meg. 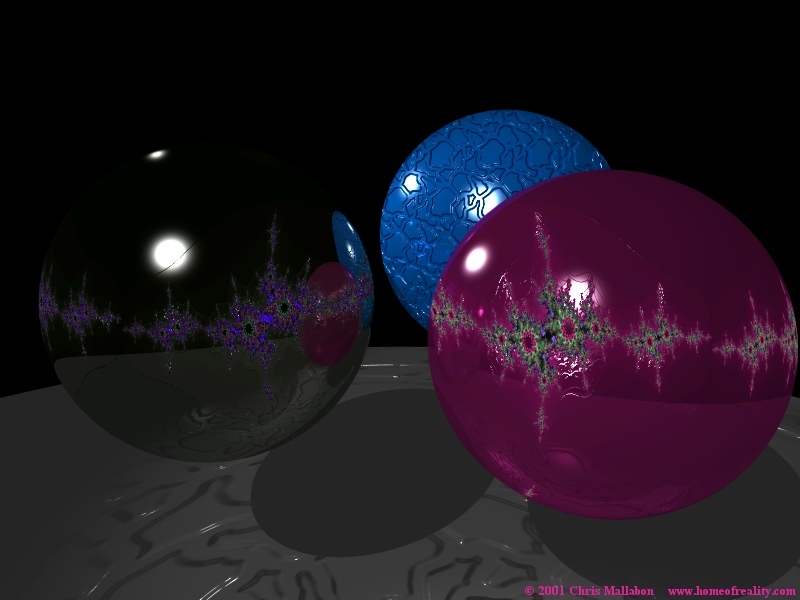 Fractal_Spheres : Just playing around with Fractint. 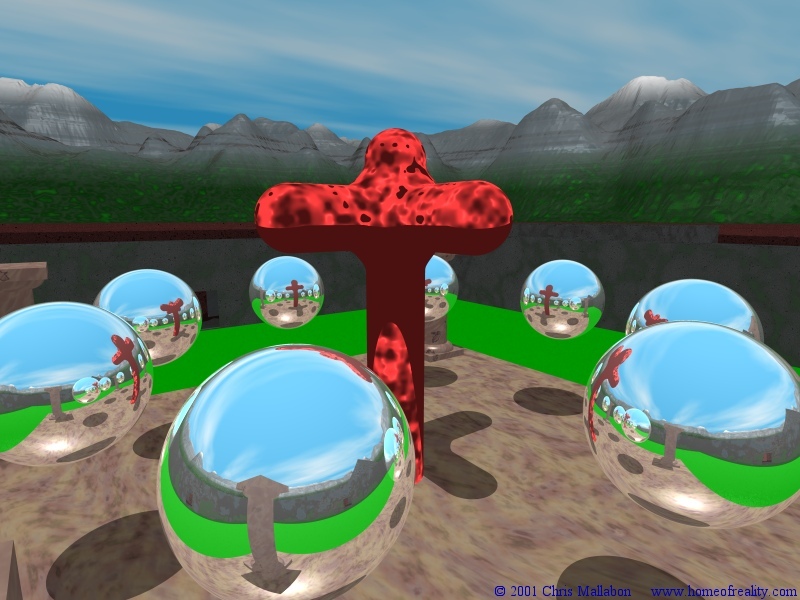 The two fractal spheres are an image map on top of a bump map using an inverse image. 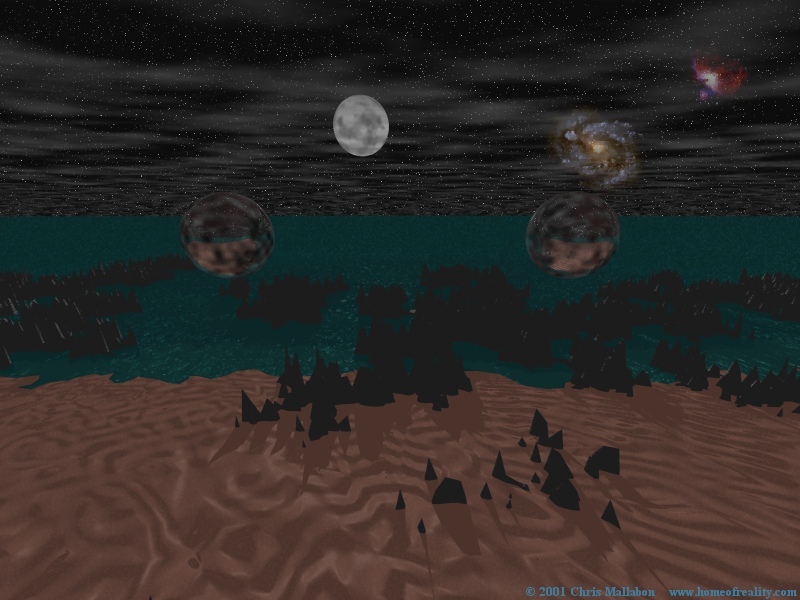 The bump map on the other sphere and the disc were mouse-drawn. As you can tell, I'm fond of blues and purples. 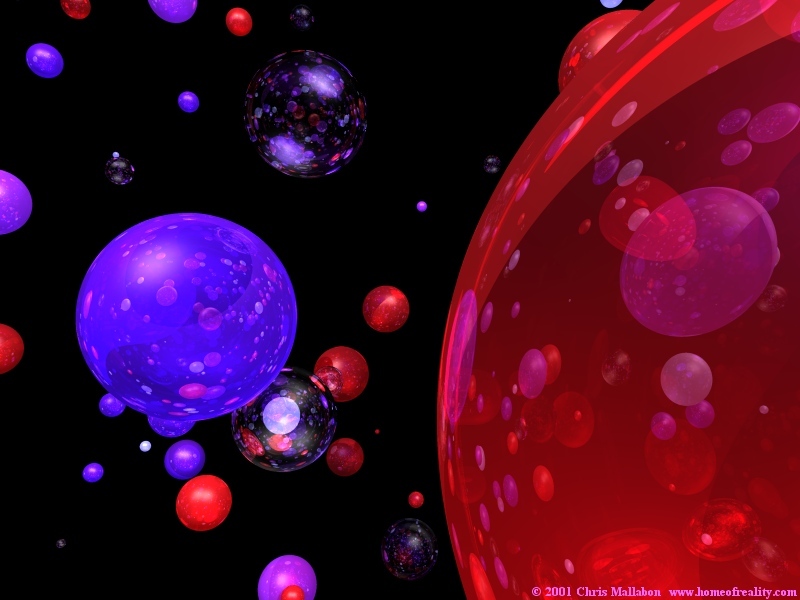 World_of_Spheres: A bubbly world. 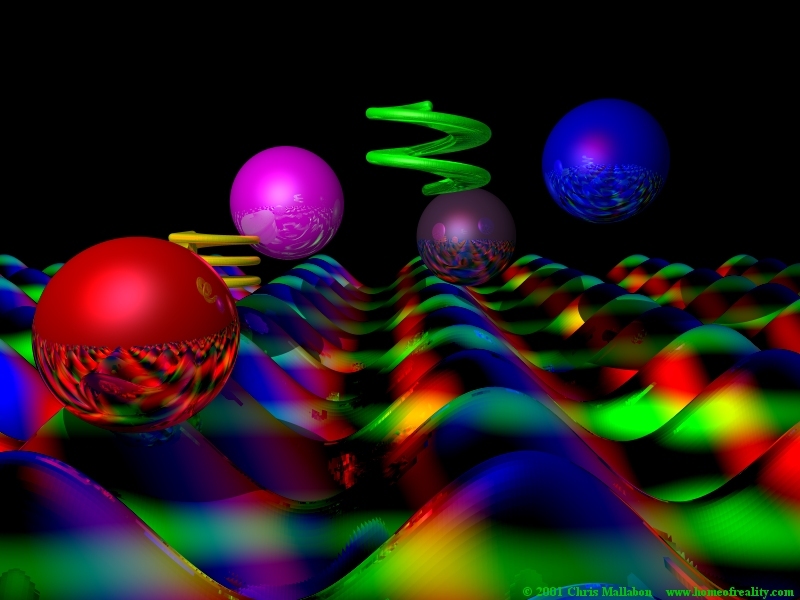 Created using Spheres.exe. This is one of my favorite desktops. I like it for all the reflections. This is a new addition to the collection. Island : Playing around with Bryce.